Originally published in the WHO Goodwill Ambassador’s Newsletter for the Elimination of Leprosy, Issue No. 68 (June 2014). The information was correct and current at the time of publication. 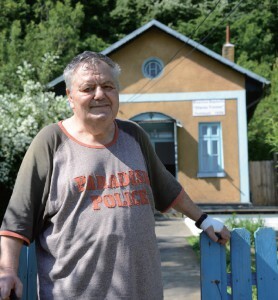 A Romanian pastor has a special bond with his congregation. 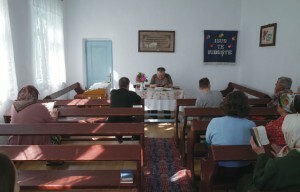 Romica Nedelcu is ministering to his small flock at the Baptist church at Tichilesti, Romania’s only leprosy sanatorium, as he does every Sunday. Casually dressed – as casually as most of his congregation – he sits at a desk decorated with a flower plucked from in front of the 75-year-old church that morning. If Romica looks very much at home among the residents of the sanatorium, it is because he used to be one himself. These are old friends and neighbors who have a shared experience of leprosy. “We are like family,” he says. Born in 1944, Romica entered Tichilesti in 1956 at the age of 12. His mother, who preceded him there by four years, burst into tears at finding him marked by the same disease. Romica, for his part, was glad to be reunited with her. Coming to Tichilesti signaled the end of his formal education. He passed the time playing chess and backgammon, going fishing and watching TV. Occasionally, with the doctors’ permission, he was allowed out to visit his father. Romica takes the service on a recent Sunday in May. As he grew into manhood, he lived from day to day, not knowing how long he would remain at Tichilesti or when his treatment would end. He began drinking, smoking and playing around. “I had several girlfriends,” he admits. Romica believes God gave him leprosy and that through leprosy he found God. He began assisting the elderly minister at the Baptist church. Eventually, he was taking the service himself. “God put in me the ability to preach the Gospel,” Romica says. He also settled down. He met his future wife through an introduction and after a three-year courtship they married and set up home in the nearby town of Braila, when he was 34. They have two sons and a daughter. Even so, the secret police occasionally came calling—once because letters containing Bible passages that Romica had sent anonymously to senior Communist Party officials were traced back to him. He says he is not ashamed of leprosy nor tried to conceal his history of the disease. It has given him an affinity to feel the pain of others, something he believes that everyone in Tichlesti has.